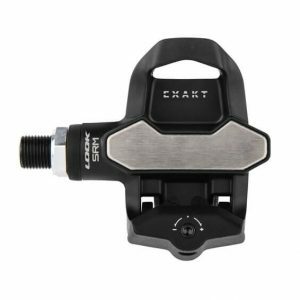 LOOK, in partnership with SRM, makes the EXAKT power meter pedal. Like other LOOK power meters, the EXAKT is built on a LOOK carbon pedal body. In addition, it benefits from SRM’s deep experience in building power meters. The EXAKT is loaded with features such as Bluetooth SMART and a rechargeable battery. Installation: Like other pedal-based power metes, the LOOK power meter is quick to install and can also be moved between bikes easily. 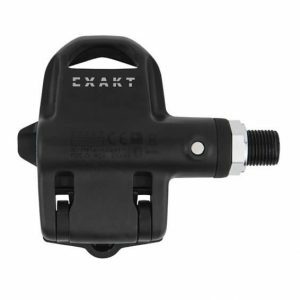 Do note however that the EXAKT comes with a mounting tool, which you need use to hold the spindle in place while you tighten down the pedals. This is an additional step not found on other pedals, but with a bit of practice, it only adds about a minute to the installation process. Weight: The LOOK power meter weighs in at 155 grams per pedal. This makes it the second lightest power meter pedal available by just a few grams. Power Measurement: LOOK power meters are available in both dual- and single-sided versions. The dual-sided version measures power from both legs as well as provides independent left/right power. The single-sided version measures right leg power and doubles it to calculate total power. Batteries: The LOOK power meter uses a rechargeable lithium-ion battery and features 100 hours of battery life. Communication Protocol: LOOK power meters transmit data via both the ANT+ and Bluetooth SMART wireless protocols. This gives you the choice of using the EXAKT with your favorite bicycle computer, smart phone or tablet. Accuracy: LOOK power meters are accurate to within +/- 1.5%. This compares to +/- 1.0-2.0% for other direct force power meters. Cadence Detection: Unlike most other power meters that use accelerometers to measure cadence, the EKAKT uses a magnet. Magnet-based cadence measurement is slightly more accurate than accelerometers. In addition, the magnet is located in the pedal body so it’s completely out of sight. Warranty: LOOK power meters come with a two-year warranty which covers the power meter from defects in material and workmanship.